On June 8, 2015, the U.S. Supreme Court granted certiorari in the case of Madrigal-Barcenas v. Lynch(“Madrigal”), vacated the underlying decision of the Ninth Circuit Court of Appeals, and remanded the case for further consideration in light of the recent June 1, 2015 decision in the similar case of Mellouli v. Lynch (“Mellouli”). Petitioner Madrigal-Barcenas can now return to the Ninth Circuit to seek a favorable disposition of his case based on the U.S. Supreme Court’s opinion in Mellouli. Tauler Smith partner Matt Smith, while at his former firm McDermott Will & Emery, was part of the team advocating on behalf of Mr. Madrigal-Barcenas. The outcome of these Supreme Court rulings significantly advanced the due process protections for immigrants facing deportation or removal proceedings following very minor convictions under state law. Mr. Madrigal-Barcenas, a 35-year-old citizen of Mexico, has lived as an immigrant in the United States for over fifteen years. He supports his four young children (three of whom are U.S. citizens), his father (a U.S. citizen), and his mother (a legal permanent resident). During his first ten years in the United States, Mr. Madrigal-Barcenas remained free of any criminal convictions or arrests. But in January 2008, Mr. Madrigal-Barcenas was arrested and pleaded guilty to possession of drug paraphernalia, a misdemeanor under Nevada law. The “drug paraphernalia” Mr. Madrigal-Barcenas was charged with possessing was a glass pipe with “burnt residue,” but the charge and conviction did not specifically identify a controlled substance. As a result of his conviction, the government initiated removal proceedings in an effort to send Mr. Madrigal-Barcenas back to Mexico. Mr. Madrigal-Barcenas fought to cancel the removal proceedings on the basis that his absence would cause hardship to his four young children and his aging parents. The government, however, argued that Mr. Madrigal-Barcenas’ misdemeanor drug paraphernalia conviction rendered him ineligible to seek cancellation of removal. The assigned Immigration Judge (IJ) agreed with the government, and the Board of Immigration Appeals (BIA) subsequently affirmed the IJ’s finding. When Mr. Madrigal-Barcenas initiated proceedings pro per in the Ninth Circuit Court of Appeals, McDermott was asked to handle the appeal through the court’s pro bono program. After briefing and argument, the Ninth Circuit affirmed the BIA’s decision and concluded that Mr. Madrigal-Barcenas was ineligible for cancellation of removal. McDermott then filed a petition for writ of certiorari before the U.S. Supreme Court, arguing that under the plain text of Section 1182 of the Immigration and Nationality Act (INA), a drug paraphernalia conviction does not render a noncitizen ineligible for cancellation of removal unless it explicitly relates to a controlled substance listed in the federal Controlled Substances Act (CSA) – which Mr. Madrigal-Barcenas’ did not. After McDermott filed its petition, the U.S. Supreme Court granted certiorari in Mellouli, an Eighth Circuit case that presented a similar statutory interpretation question under Section 1182, and held Madrigal in abeyance. Armed with the background legal research from theMadrigal case, McDermott’s pro bono team then filed an amicus brief in support of Mr. Mellouli as counsel for Heartland Alliance’s National Immigrant Justice Center (NIJC) and American Immigration Lawyers Association (AILA). 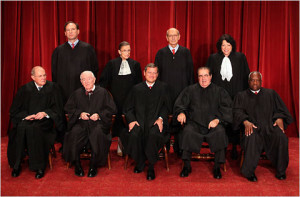 On June 1, 2015, the U.S. Supreme Court held, consistent with McDermott’s argument, that “to trigger removal under [the INA], the Government must connect an element of the alien’s conviction to a drug defined in [the CSA].” (Slip. Op. at 14.) In its opinion, the Court favorably cited the amicus brief McDermott filed on behalf of NIJC and AILA, which noted the differences in drug paraphernalia criminalization statutes on a state-by-state basis. A week later, the Court granted certiorari in Mr. Madrigal-Barcenas’ case, vacating the Ninth Circuit’s decision and remanding with instructions to consider the decision in Mellouli. The McDermott team will now return to the Ninth Circuit and seek to persuade that court that Mr. Madrigal-Barcenas should be permitted to remain with his family in the United States.